We are located in West End, an unpretentious and charming little village on the clear blue waters of Half Moon Bay. West End Resort is a hotel with 2 swimming pools, a large swimming pool for adults and a small one for kids. Located 5 minutes walking distance from West End village and 2 minutes from the closest beach. 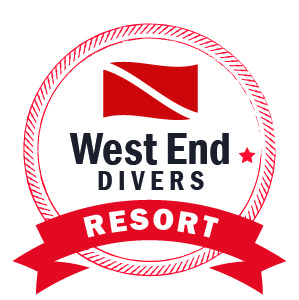 We offer 3 daily fun dives and all the PADI courses from Open wáter to IDC (Instructor). All our hotel rooms are fully equipped with free wi-fi, hot water, air conditioning, and cable TV. We expect to ensure our guests experience the island in the highest comfort.